For more information, please contact Western Union Agent in Laos. 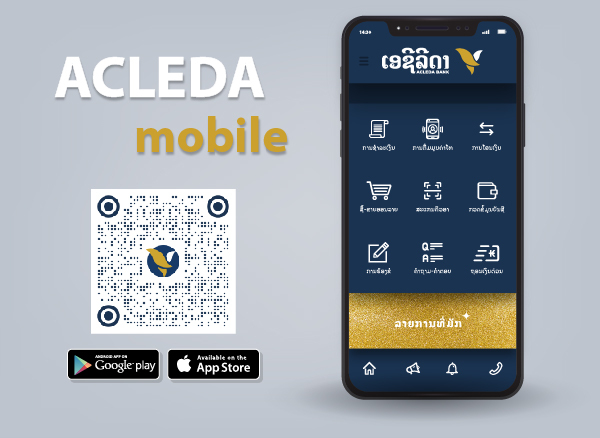 As an authorized agent of Western Union, ACLEDA Bank Lao provides the fastest and most reliable service for everyone to send and receive money worldwide. You may contact us at ACLEDA Bank Lao's nearest office serving Western Union. It is easy for you to use the Western Union® Money Transfersm service around the world. Western Union has offered consumers money transfer services for over 140 years. Each transfer can be tracked using a Money Transfer Control Number ("MTCN"), ensuring that your money is available to be paid out quickly to your receiver. Money is available for collection in just minutes(1) after it is sent. Western Union uses advanced technology and a global computer network for fast payout in more than 200 countries and territories around the world(2). Senders and receivers can go to one of our over 500,000(2) Agent locations around the world to collect or send money. No bank account is needed. Many Agent locations offer convenient hours of service throughout the week. Go to the nearest ACLEDA Bank branch serving Western Union. Fill out the "To Send Money" Form. Give the completed form to operator along with the money you wish to send, the transfer fee(3) and your identification document. The operator will give you a receipt together with a MTCN. Call your receiver and provide them with the transaction details including full details of sender name, amount being sent, sending country, and the 10-digit MTCN. Do not disclose the transaction details to anyone other than your named receiver. Fill out the "To Receive Money" Form with full details of sender name, amount expected, sending country, and MTCN. Present the form and valid photographic identification to Agent operator. Funds may be delayed or services unavailable based on certain transaction conditions, including amount sent, destination country, currency availability, regulatory and foreign exchange issues, required receiver action(s), identification requirements, Agent location hours, differences in time zones, or selection of delayed options. Additional Restrictions may apply. See Send form for details. Network data as of September 30, 2015.